British Airways is promoting its first all-class sale in print and online ads, as well as a photocall featuring Nell McAndrew in a bikini sitting on a giant deckchair. 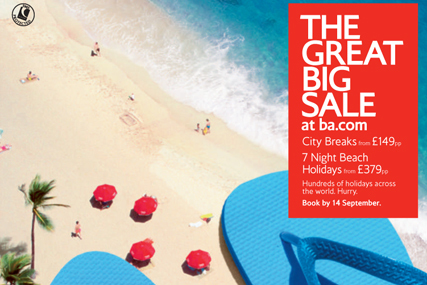 The first ads run today (26 August), promoting the Big Sale – the first time BA has offered discounts in every cabin including first class, where tickets will be discounted by as much as £4,000. They are created by BBH and appear in newspapers including Metro and the London Evening Standard. Other ads are to appear in glossy magazines and weekend supplements, and there will also be online banner ads. BA customers have also been informed of the sale via an email. McAndrew appeared at a photocall for journalists this morning to promote the launch, wearing 'her favourite beachwear", according to BA's press office. The airline blamed industrial action and the volcanic ash cloud for its £164m loss in the second quarter of the year.